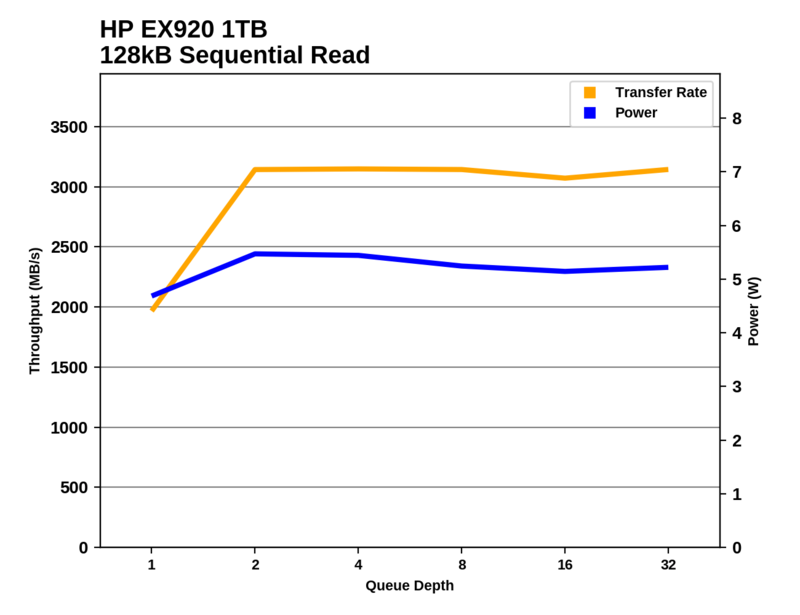 The HP EX920 breaks another record by delivering burst sequential read speeds of almost 2.5GB/s, when no other TLC-based SSD we've tested has yet hit 2GB/s on this test. 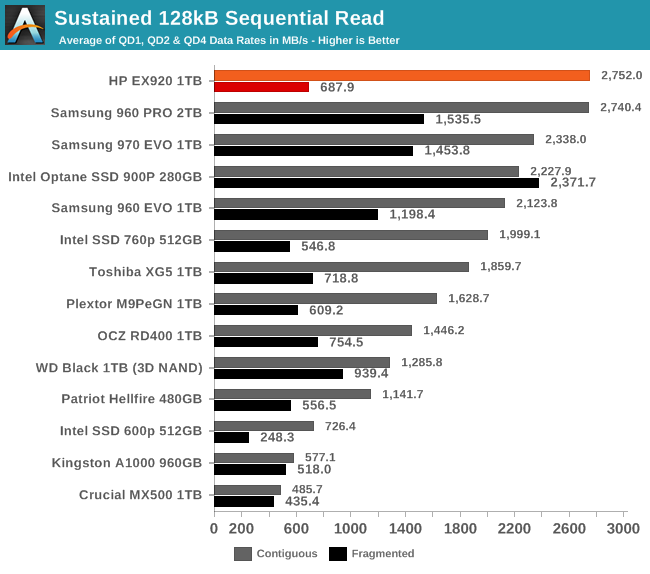 The EX920 is even beating the MLC and 3D XPoint-based drives on this test. On the longer sequential read test with higher queue depths, the Samsung 960 PRO catches up to the EX920 and Samsung's TLC-based competitors come close. However, this only applies to a clean drive and data that was written sequentially. 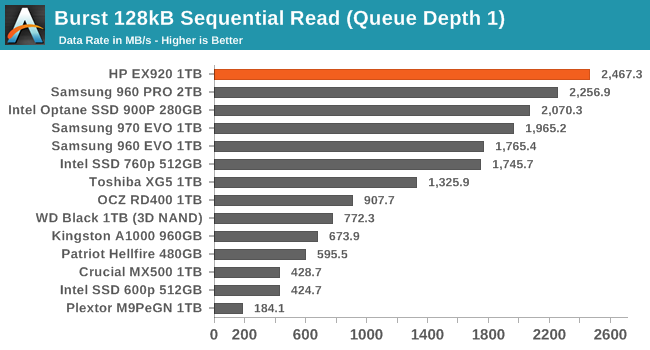 When the data has been fragmented by random writes, the sequential read speed of the EX920 drops by a lot, leaving it merely average and much slower than the Samsung drives (or the Optane SSD that is immune to this form of fragmentation). With such high sequential read performance on a clean drive, it's no surprise to see the HP EX920 near the top of the efficiency chart, even though the drive is pulling more than 5W. 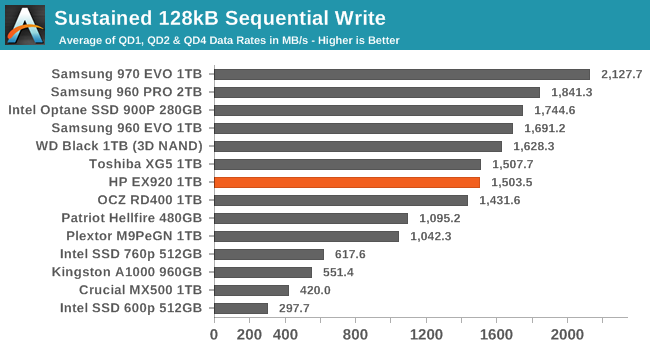 On fragmented data the EX920 ends up worse off than any drive that isn't using a Silicon Motion controller, because the sequential read speed tanks while power consumption remains about the same. The HP EX920 gets up to speed very quickly, reaching full sequential read speed at QD2 when several high-end NVMe SSDs require quite high queue depths to deliver their best performance. The EX920 is eventually surpassed by numerous competitors, but at low to mid queue depths it is definitely the fastest. The burst sequential write speed of the HP EX920 is great, but it is overshadowed a bit by the large lead Samsung's 970 EVO has on this test. 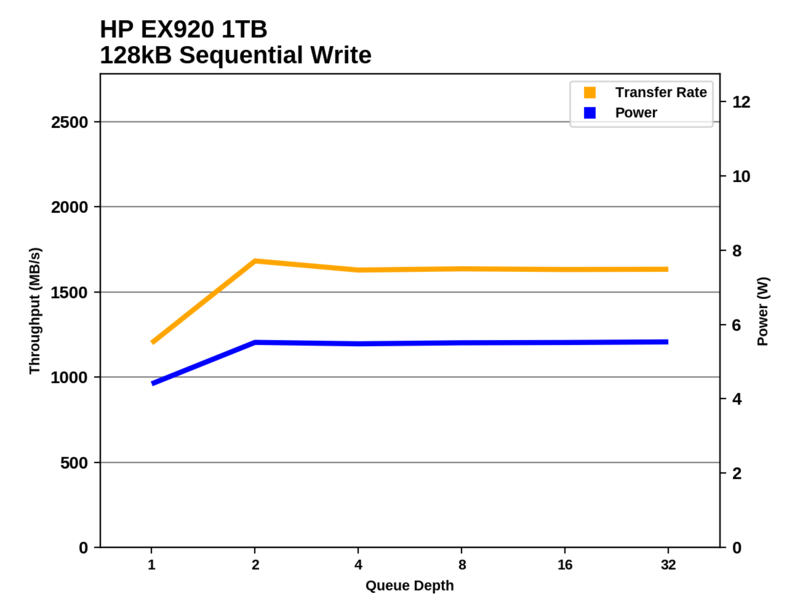 On the longer sequential write test, the HP EX920 falls a bit further behind as the scores of the top-tier drives are a bit more spread out than for the burst test. The EX920 is still providing performance that is worthy of a high-end NVMe SSD, but it can't match Samsung or WD. 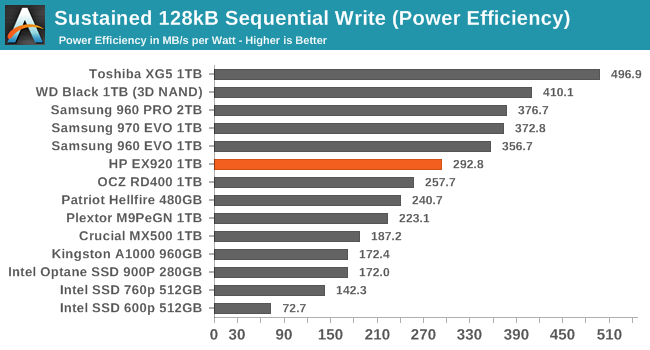 The power efficiency of the HP EX920 on the sustained sequential write test is good, but several drives deliver higher performance while drawing less power, and the 970 EVO offers substantially higher performance with only slightly higher power draw. 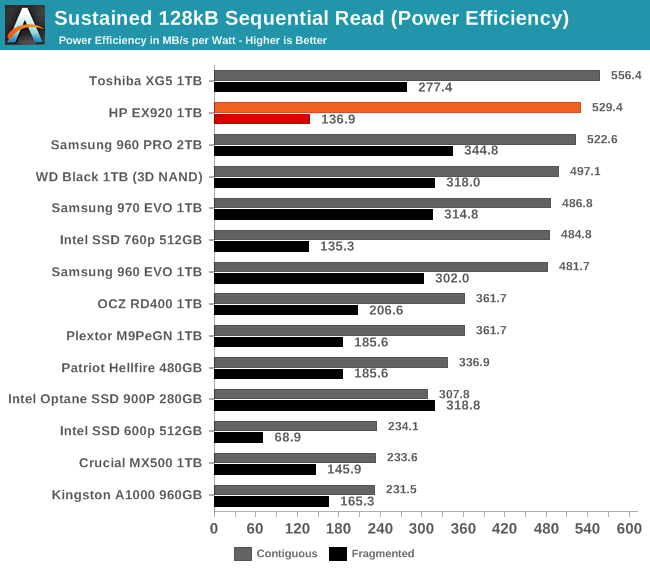 The most efficient drive is still the Toshiba XG5, which performs the same as the EX920 on this test but draws only 3W while the EX920 requires more than 5W. Like almost all drives in this class, the EX920 shows very consistent performance across most of the test duration, with the only hint of SLC write caching effects showing up in the slight drop in performance after QD2. The Toshiba XG5 is the most notable exception, as it takes a bit longer to get up to speed.